A water park in Kansas, America is building the tallest and fastest waterslide in the world. The Verrückt (which means 'insane' in German) Meg-A-Blaster makes its debut next spring when water park Schlitterbahn opens. According to The Kansas City Star, visitors will have to climb 264 steps to reach the top of the 140ft-tall waterslide before travelling over 65 mph to get back down. Layne Pitcher, the park's director of marketing and sales, said: "We have always been family friendly, but this will attract those adrenaline junkies who are always looking for that next biggest, coolest thrill." USA Today reports that the waterslide will shatter records set by a slide in Brazil, which is 134.5ft high and moves at 65.2 mph. 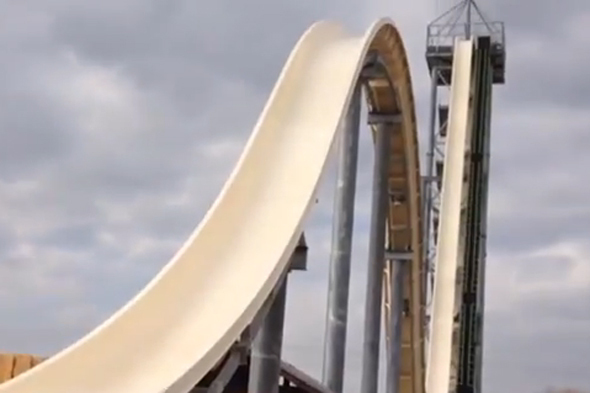 Would you brave the world's tallest waterslide?